Salsify’s onboarding philosophy revolves around anticipating and preparing for continuous changes in the commerce landscape. Our Fast Track Onboarding Services Package begins by collaborating with a Salsify Customer Champion to develop a program plan to ensure a successful Salsify roll-out for your company. Once goals have been solidified and planning is complete, your Project Team will have the ability to attend Standard Group Training sessions aimed at providing you the foundational knowledge needed to utilize the platform. Salsify experts will provide configuration the platform, as well as provide best practice guidance on the ongoing administration of the Salsify platform. The goal of the Salsify Fast Track Onboarding Services Package is to provide a configured Salsify platform that will provide your organization with immediate business value, as well best practice recommendations in order to continue to drive utilization forward. 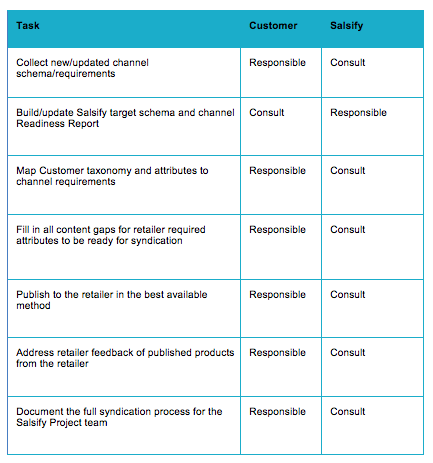 The scope of the Salsify Fast Track Onboarding Services Package includes the services enumerated here ("Onboarding Services") in support of the above objectives, delivered during the Onboarding Period and subject to the assumptions set forth below. Project plan for your implementation based on your priority goals. This will include requirements gathering calls with a Salsify Implementation Consultant, attendance of trainings and recommendations for advisory hours with an Implementation Consultant. Syndication Milestone. Salsify will complete the full setup, mapping, and publish of up to three Salsify channels. Salsify will schedule and conduct a review of your Salsify platform configuration for your project team once the implementation configuration outlined as part of this package has been completed. A core project team, including at least one Salsify Administrator to drive ongoing administration of your Salsify account, including additional configuration beyond the initial implementation configuration outlined in this package. Additional personnel with expertise in source systems to be integrated into Salsify, expertise in customer/account relationships, and expertise in your product content to work closely with your Salsify Administrator and Salsify Project Team on integrating source systems, mapping product categories, mapping product attributes, and other implementation areas as appropriate. Customer will be responsible for providing product identifiers, data types, category hierarchy / taxonomy, and property definitions. Customer will be responsible for providing a consistent naming convention across assets that reference a consistent identifier. For example, an asset filename can include your product SKU and image type delimited by underscore: 1234_Front.jpg. Customer will be responsible for providing content extracts in a CSV (comma-separated value) or single-sheet tabular XLSX file export. Customer will provide Salsify the credentials for any retailer portals needed to publish content and assets. 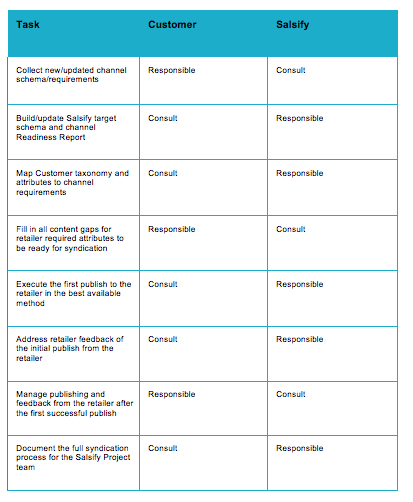 Customer will make resources available to address all content gaps for required attributes in the retailer channel in a timely fashion for a minimum of five products. After 30 days of the mappings being completed, if no products have all the required content for syndication, the Customer waives support for the publishing and review of retailer feedback for that channel. The Onboarding Period is defined as the term beginning on the date of your Salsify kick-off meeting and extending for 90 days following that date. The services defined in this document will be deemed complete and expire at the end of the Onboarding Period. Advisory Hours: To be used at any time during the Onboarding Period to support your project team in configuring additional content loads, channels, and workflows beyond the scope of the Implementation services in this package. We request Customer limits advisory requests for live sessions to no more than eight hours in any single month or two hours in any given week. Consult– The consult party provides expertise and information to support the responsible party in completing the corresponding task.